My daughter recently asked if I could please buy some strawberry jam. It seems she’s become used to eating it while on holiday with friends recently. However, with my aversion to sugar and high calories, I've more or less given up on buying jam for the household, thinking I’m doing everyone a health favour. They don’t appreciate this, so I decided to see what was available in the reduced sugar jam range. 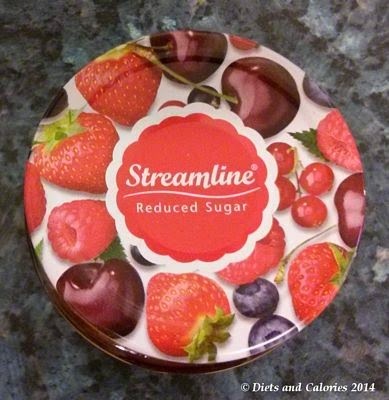 The jar that stood out for me was this brand by Streamline: Less Sugar Strawberry Jam. According to the label it has “More Fruit Less Sugar” and one tablespoon contains 26 calories. Many years ago I bought a lower sugar jam and it really wasn't up to much. It had a strange spongey consistency and didn’t much resemble jam. Let alone taste like it. 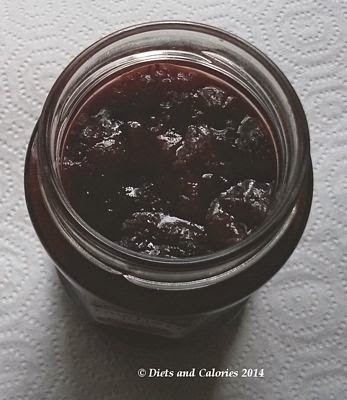 This jam looked promising as soon as I took the lid off. Nestled snugly together were large clusters of whole strawberries. And the smell was rich and sweet and very definitely real strawberries. First comment from my daughter was ‘it spreads well and smells yummy’. 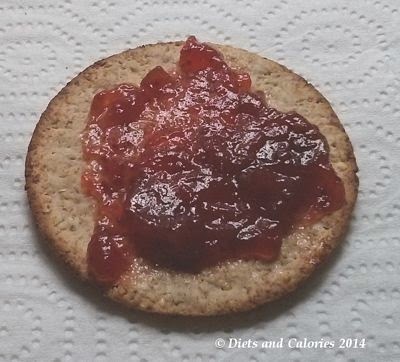 I had a small taste on an oatcake and found it had a lovely flavour. The strawberry pieces spread smoothly and the seeds give a slight crunchiness. My daughter is very happy too and says she wouldn't have known it was a lower sugar jam. Prepared with 50g of fruit per 100g of jam. So how does it compare with regular strawberry jams on the calorie, fruit and sugar front? 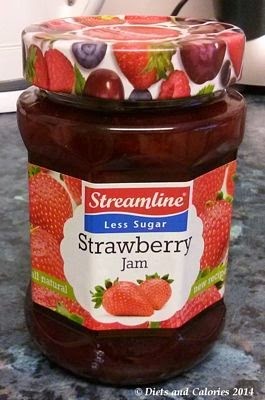 Well, the Streamline Jam has 26 calories per tablespoon (15g) of which 6.2g is sugar (1.5tsp). Tesco Finest Strawberry conserve has 38 calories and 9g of sugar per tablespoon and 55g of fruit per 100g. Hartley’s Best Strawberry jam has 37 calories, 8g of sugar per tablespoon and 45g of fruit per 100g. ASDA Strawberry Jam has 38 calories and 55.2 and 8.3g of sugar. Robinsons Strawberry Jam & Summer Fruits Less Sugar Jam has 26 calories, 6g of sugar and is prepared with 45g of fruit per 100g. Nutrition Information per 100g: 176 calories, 0.4g protein, 42.0g carbs, 40.9g sugars, 0.3g fat, 0g saturates, 0.8g fibre, 0g salt. Ingredients: Strawberries, glucose fructose syrup, sugar, water, gelling agent: pectin, lemon juice. Other Information: Suitable for vegans, vegetarians, coeliacs, gluten free. No artificial flavours, colours, sweeteners or preservatives.